For the last several years, I’ve shared the story about proper storage, layup and preparation and the joy it delivered as my annual tug-of-war with the grass cutting machine nearly killed me. And then some words of wisdom from my Dad, “Run it dry when you shut down in November” put an end to the agony. 2014 was the tenth year in a row. Result? A first pull start for a decade or so. This is an amazing thing. This year, that wonderful streak came to an end. The prep was sufficient and I even changed the oil, bought the best gas, etc. — but I may have primed one too many pumps of the bulb. But it started on the second pull this year!!! We’ll take that as almost as good. There’s no comparison to the brutal wrestling matches of yore or trips to the repair shop of the past. The average Value Line low total return forecast for the companies in this week’s update batch is 5.7% — higher than the 3.7% for the Value Line 1700. Value Line Low Total Return (VLLTR) Forecast. The long-term low total return forecast for the 1700 companies featured in the Value Line Investment Survey is 3.7%, unchanged from last week. For context, this indicator has ranged from low single digits (when stocks are generally overvalued) to approximately 20% when stocks are in the teeth of bear markets like 2008-2009. I don’t know. But the combination of a declining $USHL — remember, the number of 52-week highs crests well before a bear market, much like the first signs of falling leaves in Autumn — with the historical low overall return forecasts is cause for vigilance. I’ve started exploring some of the work of Harry Dent, the demographics-centered economist. Dent’s forecasts back in the 1990s certainly merit a closer look because he’s concerned about the outlook for 2015 and 2016. Stay tuned. In the meantime, quality is your friend. When buying, demand high quality and leadership financial strength. 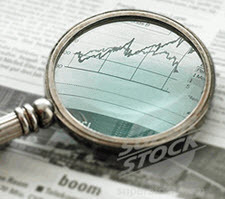 During an investment club visit this morning, one of the experienced investors made an observation about the relative lack of volatility in the market right now. My answer was framed around the reality that lower volatility generally leads to lighter paychecks on Wall Street (traders can make more money with more amplitude and frequency in both directions) and that if anything — being “too quiet” is actually disquieting for long-term investors because the rhinos can get restless and go on a misbehaving rampage. It’s the type of condition that fostered the leverage insanity of a few years ago and let’s face it, very little has actually been remodeled or remedied since those tumultuous days a few years ago. $VIX is a measure of general volatility and we see the quiet-too quiet days of 2007 which led up to the Great Recession and the current conditions.